Cue Energy Ltd (ASX & PNG: CUE) will relist on the New Zealand Stock Exchange today as the company has just secured new exploration assets. Cue has gained a 20% stake from Todd Exploration in permit PEP 51313, immediately adjacent to the Maari and Manaia oil fields in the offshore Taranaki Basin in which it holds a 5% stake. The permits cover an area of 2,628 square kilometres and the five year permit term began on July 30 this year. 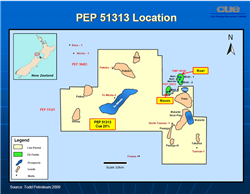 Cue Energy’s chief executive Robert Coppin said the permit incorporates most of the area of PEP 38494 in which Cue was obtaining a 20% interest. This permit was relinquished earlier this year and has been incorporated into PEP51313. The permit work programme, in the first two years, consists of seismic reprocessing, 3D seismic acquisition over the greater Matariki area and the acquisition of 2D seismic in year two. The joint venture has the option to drill exploration wells in the third and fifth years. Cue will earn its 20% interest by reimbursing Todd for Cue’s equity share of prior permit costs and in addition funding part of Todd’s share of the 3D seismic costs. 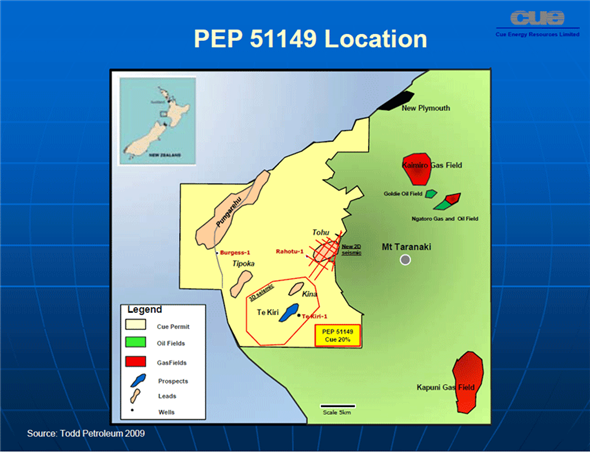 Participants in PEP 51313 are: Todd Exploration 50% and operator, Horizon Oil (New Zealand) Ltd 30% and Cue subsidiary Cue Taranaki 20%. 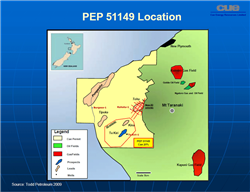 Cue is obtaining a 20% interest from Todd Exploration in permit PEP 51149 which is largely onshore in the Taranaki Basin, south of New Plymouth. Cue is earning this equity by reimbursing Todd Exploration for Cue’s equity share of permit costs incurred from the award of the permit in September 2008. PEP 51149 contains several prospects and leads that have potential to contain significant commercial volumes of natural gas. A 2D seismic survey has recently been acquired over the Tohu lead. The joint venture has the option to drill exploration wells in later years. Participants in PEP 51149 are Todd Exploration 50% and operator, Mighty River Power Ltd 30% and Cue Taranaki 20%. Coppin said acquisition of interests in these permits will build on Cue’s interests in the successful Maari and Manaia oil fields. Each of the new permits contain prospects and leads that have excellent potential for future oil and gas discoveries. The NZX said yesterday that the Todd Energy group owns 27% of Cue and would relist on the NZX today. New Zealand shareholders retain a stake of about 40% in the company. The Intierra Resource Intelligence website says Cue Energy, then as an NL company, listed on the NZX in 1981, and on the ASX in 1995 and the PNG exchange in late 1999. It did not detail when Cue delisted off the NZX. The offshore Taranaki Maari oil field began production in February 2009. Since then two further discoveries have been made at the Maari M2A sands and the adjacent Manaia field. According to James Weir of the Dominion Post newspaper they collectively hold more than 100 million barrels of recoverable oil. New Zealand's largest locally owned energy producer, Todd Energy owns 27% of Cue. New Zealanders already hold 40 per cent of Cue Energy's shares. Cue’s chairman (and also chief executive of Todd Energy, Richard Tweedie, said: "Cue's investment in the Maari field has created outstanding results." Cue Energy has oil production in three countries -- Papua New Guinea, Indonesia and NZ and recently started producing gas in Indonesia.